Cleaning and maintaining grout lines can be tedious, time consuming, frustrating and a physically exhausting job. Homeowners spend countless hours on their hands and knees scrubbing the grout lines just to watch them get dirty again in a couple of weeks. Grout is a very porous material made up of cement and sand. Because grout is porous dirt, grease, mildew and bacteria can penetrate deep into the grout lines causing discoloration and odor. Dirt gets trapped in the pores of your grout lines which can make the surface look dark and dirty. This can be impossible to remove with traditional cleaning methods. From deep cleaning to protection and restoration, Duraclean can help with all your tile and grout cleaning needs! Just like carpet, dirt builds up over time, dulling your tiles appearance and discoloring your grout. Our thorough high pressure tile and grout cleaning removes the deep down dirt that lies within the pores of your grout lines. As a tile restoration company we are dedicated to the art of cleaning, sealing, polishing, stripping, and more. We are working to make tile look beautiful every day. 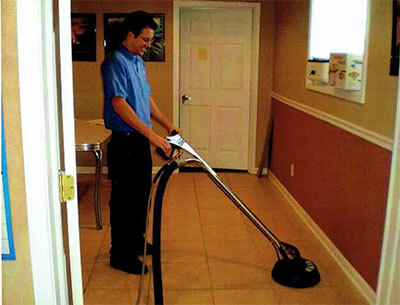 Whether your floor is newly installed or 25 years old, we have the solution to make your floors look beautiful. A finishing coat of our sealant will keep your grout protected and looking its best.